National Colors Red and blue. Magrakor is the home land of the Magrakians. The heavy set, pig like magrakians are a hardy race of immense strength, unending fortitude and crude manners. It is a land of stout stone castles, crowded taverns, boisterous music and public games. It is a land filled with life and culture. Because of its somewhat central location and the fact that the magrakians are generally a friendly people, Magrakor has become something of a cultural and racial melting pot, especially the city of Okslad. Within Okslad, one may find a variety of races, especially Aukarians and Eshtari who trade frequently with the Magrakians. Hyttar, vaullians, saridians and even a few sybrenar may be found here (the latter in small numbers due to the current war). Magrakor is based around the Bay of Okslad. The nation is rather bowl shaped with the bay at its center. Radiating out from the coast of the bay are broad grassy prairies and farmlands which gentle raise up into rolling foothills and mountains beyond. A number of aquaducts carry water down from the highlands to the farmlands of the plains. The ancient Helgar mountains dominate the southern horizon. To the east lies the legendary Fyrren's Wandering, a virtual maze of canyons. The north western region of Magrakor is bordered by the vast Wild Wood forest, a huge expanse of dense woods that is home to many foul beasts. Magrakor enjoys hot summers, warm wet springs, cool windy autumns and mild winters. Seasonal storms sweep the eastern half of Magrakor each spring and autumn. Magrakor has a breed of short legged, black haired oxen used for both food and labor. This animal is so common in Magrakor that it is often identified with Magrakor and vice versa. Along the coast, there is the usual spectrum of fish and other seafood. Fish is an important part of the magrakian diet. The Murky River is home to a particular species of bright silver fish called silver tarns which the magrakians use to make a popular beverage. Dragon eels occasionally hunt along the coastline and terrorize coastal villages. Black root grows prevalently in the area and has worked its way into much of magrakian cooking. The history of Magrakor is like its people - slow, plodding and methodical. After the devastation of the Kytohan Empire, the remnants of this region were little more than scattered villages and hill clans. Raiders and bandits prowled the region for years afterward. Fragments of the Kytohan military fought to protect what little was left of the Empire. Towns, villages and soldiers banded together for protection under the flag of Magarak, a military officer. This small collection of peoples held together during the dark years after the Cataclysm. For centuries the towns and militias stood together. By 1000 CY, they had coalesced into seven distinct counties. In 1457 CY, these seven counties united under a single banner and formed the United Counties of Magrakor. The town of the largest and most powerful county, Goloti, became the capital city. The Arch-Praelet is a hereditary position much like a King. The Arch-Praelet rules from the capital city of Okslad with input from representatives of the seven counties. Arch Praelet Ofedor is aided by a council of advisors and scholars. These provincial representatives and advisors together make up the Grand Council of Okslad. They hold court once a month with the Arch-Praelet in attendance. The realm of Magrakor is divided up into seven counties. Each county is ruled by a Praelet (similar to a duke or baron who also serves as head town official). Each county is ruled by its largest town which protects and taxes all the villages of its region. Each Praelet answers directly to the Arch-Praelet. 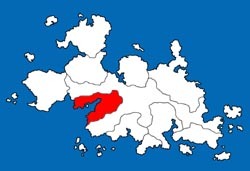 The largest county, Goloti, is headed by Okslad itself. The Praelet of Goloti is the Speaker of the Grand Council. The legal system of Magrakor is tough, but fair. While the magrakian people are a hardy race who can endure much physical punishment, they dislike the cruelty of sheer torture and similar forms of punishment. Crimes are typically punished with stiff fines, hard labor, imprisonment and banishment. Execution is reserved for only the most heinous crimes. Hard labor is probably the most common form of punishment. Most cases are brought before a judge and these wise authorities often mete out punishments that involve patience, hard work and persistence. Punishments usually relate to the nature of the crime in some way. For instance, a thief who steals from a jeweler might be indentured to work at a diamond mine for one year with all of his wages going to the jeweler he stole from. Disputes between magrakians are often settled with duels which run the gamut from civilized sword play to board wrestling. In addition, every city, town and village has at least one pair of "sitting poles". Sitting poles are considered a time honored method of settling a dispute. Each contestant will climb to the top of a sitting pole and sit at the platform on top. Sitting poles are always found in pairs and they are usually placed on either side of a public street so that the two opponents face each other. While engaged in a sitting pole "argument", neither may eat or sleep or drink. It is a test of endurance. The first to climb down forfeits his claim in the dispute. Some particularly stubborn magrakians have died when engaged in such matches. Most towns, villages and provinces in Magrakor require a term of military service from each magrakian of adult age. Most regions require at least 2 years of service. Okslad, the capital city of Magrakor, is a major port city. A number of cargo laden ships arrive and leave this port everyday helping to contribute to a vibrant and booming economy. The recent military conflicts with the Sybren Imperium have strengthened certain segments of the Magrakian economy. Fishing and agriculture is the foundation of the Magrakian economy. Most goods are transported about the kingdom by wagon on a network of well worn dirt roads. The standard currency of Magrakor is the silver hunedari and the copper crum. 1 Silver Hunedari = 40 Copper Crum. The silver hunedari is a very large, thick coin. The copper crum is a fairly small square coin. Magrakor is blessed with large deposits of silver and copper, but virtually no gold. Therefore, their currency is based on silver and copper. In general, magrakians are an extremely friendly and sociable race. They love to eat, drink, socialize, dance, laugh and play games. Cities are towns are always crowded. Taverns are always filled with laughter. Magrakians are a gregarious lot whose humor is sometimes seen as crude. Gift giving is an important part of social life and occurs on a daily basis. Gifts are exchanged at greetings, partings, introduction between strangers, important life events, parties and often for no reason at all. The gift is given along with a brief explanation of its history or meaning to the possessor. "I gift you with this dagger – given to me by my uncle seven years ago, made by a master smith of the north lands." The value of the gift and the nature of the "speech" is directly proportional to the significance of the event. For instance, during extremely important events, family heirlooms may be given away with a long prepared speech and open weeping. On the other hand, magrakians meeting for the first time may exchange small token gifts and a brief blessing or statement of friendship. Such items are often kept on hand for just such occasions. Being a friendly people, the magrakians go out of their way to greet everyone, be it life long friend or complete stranger. The most common Magrakian greeting is "Stone and Strength to You!". A common blessing, quoted often, is "Be like stone" which sums up much of the Magrakian beliefs. The most popular alcoholic beverage throughout the nation of Magrakor is something called baklath (BOK-loth). This foul concoction is made from fermented fish guts. Various kinds of fish guts are used, but true baklath is made from the guts of silver tarns, the long, bright silver fish common in the Murky River and Bay of Okslad. Magrakians love baklath, but most other races are barely able to tolerate the stench. It is typically served in bowls. A ladle is used to fill the bowls because baklath often has chunks of fish meat in it. Many magrakians like to drink their baklath warm. Festivals are frequent and popular throughout the land. The largest festival is the Okslad Summer Games, a week long celebration centered around wrestling, races, tests of strength and endurance and an array of cooking and brewing contests. Another important festival is the Sea Fair which involves boat racing, boat building, swimming and seafood. Most of the Sea Fair activities are conducted on hundreds of boats out in the Bay. The magrakians have no great skill at the arcane arts. The vaporous intricacies of spells and magic are perhaps too subtle and delicate for the magrakian mind. In any case, magrakian mages are quite rare. There are no schools of magic in Magrakor, which is surprising for a nation of this size. Instead, all magical lore is passed down from master to apprentice. There are no laws governing mages whether they be magrakian or visiting from distant lands. Magic is seen as useful only when it is simple and produces results. To the magrakians, too much of magic is overly complicated or shows little benefit. Okslad Goloti 84,000 As the head county, Goloti enjoys a position of power among all the counties. The officials and citizens of Goloti are sometimes seen as arrogant and snobbish towards the other eight counties. Schlauger Drunger 45,200 Known best for Schlauger Ale, this community of woodsmen and farmers must deal with raids from humanoid tribes that dwell in the Wild Wood, roaming monsters, packs of wolves and lost children. The militia here is very tough as they are always busy with some problem. Faush Rusyn 31,400 Faush is a major fishing town and has some excellent shipyards. Faush has a good natured rivalry with Heisler across the Bay and the two towns compete in all manner of competitions and contests - everything from wrestling champions squaring off at summer festivals to record fish sizes and total summer catches. Faush has a large lighthouse which sits out on a rocky promontory. It is a squat stone tower with an enormous fire pit at the top. This well-known landmark is ancient having been erected by the Kytohan Empire. There is an identical lighthouse in Heisler. Gromal Keredon 27,600 Major farming center. Primarily beef cattle and some dairy farms. Aukveis Hauswald 19,000 Coastal town known for ship building. It also has several Kytohan ruins nearby. Heisler Orglak 15,000 Heisler claims to have the best fishing spots in the Bay of Okslad and judging by their hauls, that may be true. Heisler competes with Faush, as mentioned above, and currently is home to the wrestling champion of Magrakor. Heisler has a lighthouse which is identical to the one in Faush. These two lighthouses were built as a matching pair and together they mark the mouth of the Bay of Okslad. Braushkem Schilden 14,000 A small town at the mouth of the Jade River that sits on the western border of Magrakor. Braushkem maintains a small sleet of ships that patrol the mouth of the bay. Osk Dengon 11,200 There is a long winding dirt road that trails from Osk up into the mountains, through a mountain pass and down to Eshtar on the other side. Osk is a trading center for caravans and riders coming and going from Eshtar. Ufsdol Mensark 9,500 This small town is the eastern most town of any significant size in the nation. As such, it is frequent caravan stop for all caravans that are coming from or heading to Fyrren's Wandering (and the Aukarian Republic beyond).